Ready for something sweet (but secretly healthy)? I have just the thing. 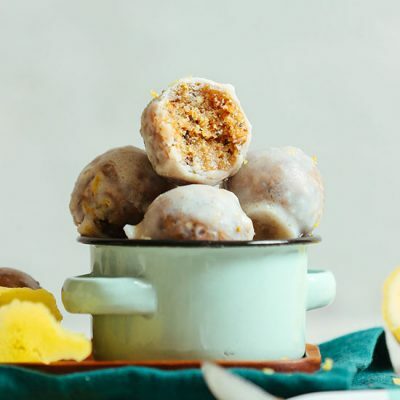 No-bake vegan donut holes! Yes, it’s a thing. Let’s do this! This 30-minute, 10-ingredient recipe starts with dates and nuts (walnuts or cashews or both), which creates a sweet, slightly nutty base. Next come coconut and almond flour for a fluffy, cake-like feel. This is what makes them more the texture of cake or donuts than an energy bite. 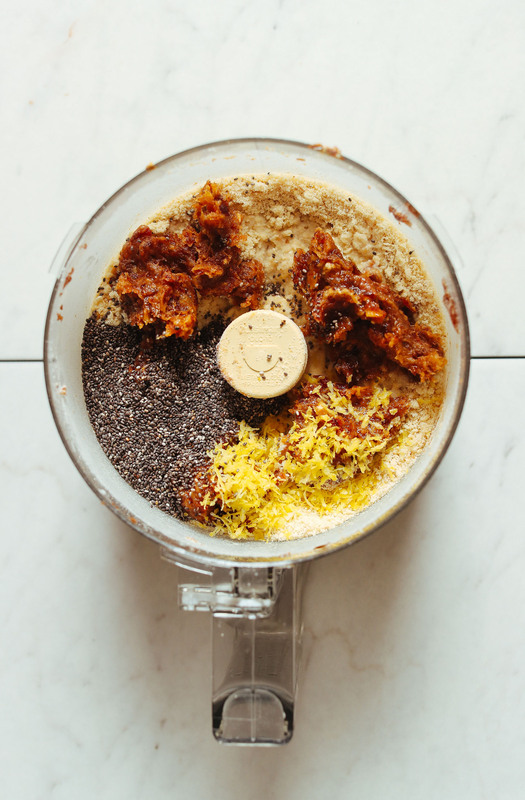 The flavor comes from lemon juice and lemon zest, and the crunch comes from the addition of poppy seeds or chia seeds. Then just roll them into balls, freeze, and prepare your glaze. For the glaze, I played around with a coconut butter option, but when you add liquids to coconut butter (e.g. lemon juice and maple syrup), it tends to seize up. So I went for a coconut oil-maple syrup glaze instead. However, I do include an oil-free glaze option in the notes! These donut holes would make the perfect healthier snack or dessert. The lemon juice and zest punch through with a tart kick, which perfectly balances the sweetness of the dates. Plus, that glaze? Total swoon. If you’re into naturally sweet treats, check out our No-Bake Vanilla Cake Bites, 5-Ingredient Vegan Caramel Sauce, Vegan Chocolate Mousse, 3-Ingredient No-Bake Peanut Butter Cookies, and Coconut Carob Bars. If you try this recipe, let us now! Leave a comment, rate it, and don’t forget to tag a photo #minimalistbaker on Instagram. Cheers, friends! 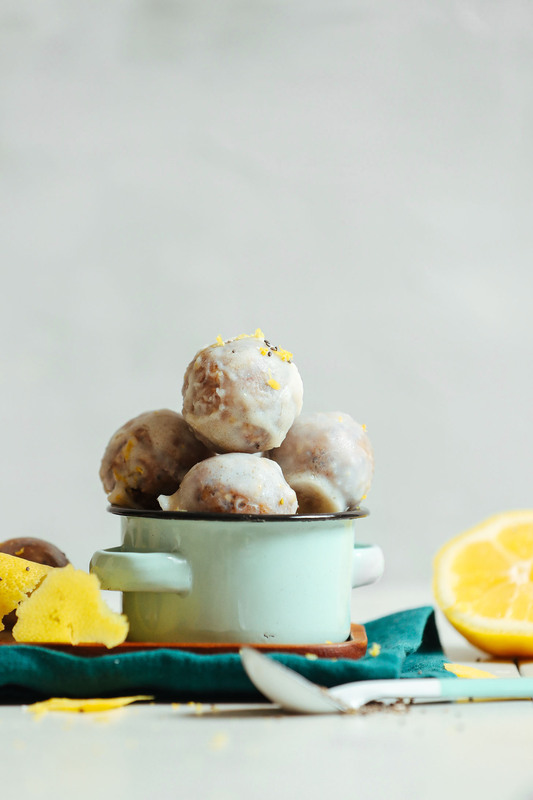 Tender no-bake donut holes infused with lemon juice and zest and speckled with poppy seeds! A 30-minute naturally sweetened, easy-to-make snack or dessert! Line a baking sheet with parchment paper and set aside. 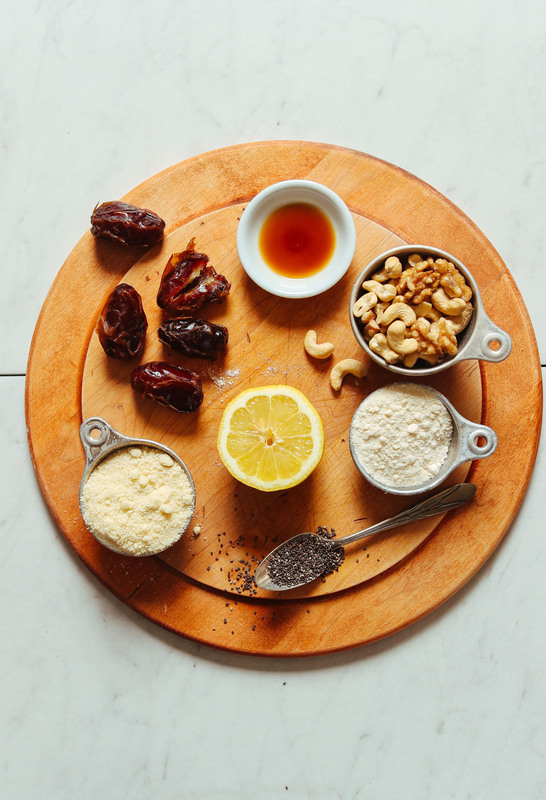 To a food processor, add pitted dates and blend until small bits remain or a ball forms. Scoop out and set aside. To the food processor, add your raw nuts, almond flour, and coconut flour. Blend until a fine meal is achieved - about 20-30 seconds. Add the dates back in along with the lemon zest, lemon juice, poppy or chia seeds, and vanilla extract. Blend until a tacky dough forms. If it’s too dry, add a little more lemon juice. If it gets too wet or sticky, add more coconut flour as needed. Scoop out 1 1/2 Tbsp amounts of dough (I like this scoop) and roll into balls. Repeat until all of your mixture is used up. Arrange on your parchment-lined baking sheet. Transfer to the freezer and freeze for 10 minutes. 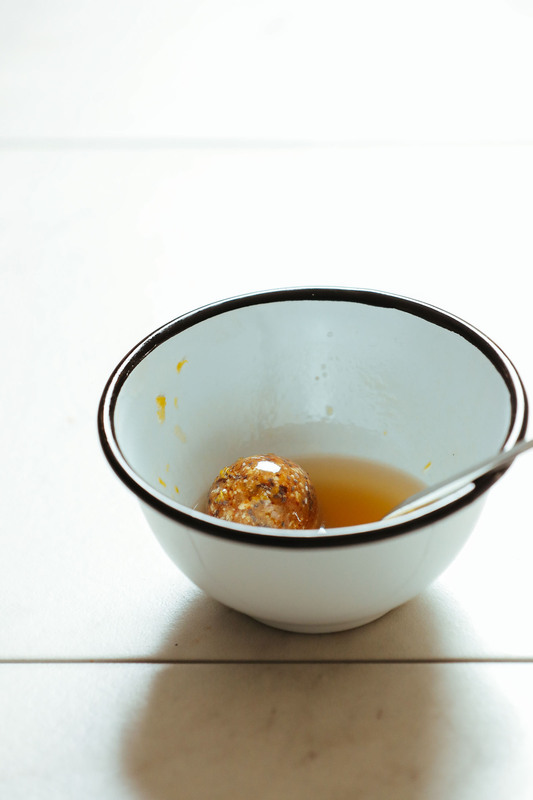 In the meantime, prepare glaze by adding all ingredients to a mixing bowl and whisking thoroughly to combine (a little separation is natural - just stir again before glazing). Remove donut holes from the freezer, and one at a time, dip donut holes into the glaze. Lift up with a fork or slotted spoon and tap off any excess glaze. Place back on the parchment paper to harden. Repeat until all donut holes are glazed. Then carefully transfer back to the freezer to set. Freeze for 10 minutes. Then remove from freezer and dip again. You can repeat this process as many times as you can before the glaze runs out (I was able to dip all of my donut holes twice and rolled a few of them in a third time - though I found two times to be sufficient). Pop back in the freezer to chill again until set - about 10 minutes. Enjoy! Store leftovers covered in the refrigerator (up to 1 week) or the freezer (up to 1 month). They can be stored at room temperature, but if too warm, the glaze can melt. 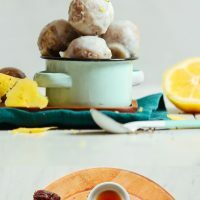 *An oil-free glaze option would be 4 Tbsp coconut butter, 1 tsp lemon zest, and stevia to taste (adding liquids to coconut butter will make it seize). OR use this recipe for a white chocolate version. *Nutrition information is a rough estimate calculated with half cashews and half walnuts, with chia seeds, and with all of the glaze. *Recipe concept inspired by This Rawsome Vegan Life, which was originally adapted from Lee from America. I just made these without the glaze and oh my GOSH I am absolutely blown away. I love lemon cake and all things lemon and cannot believe how perfect these are. I didn’t have coconut flour so I used all almond flour and it worked out perfectly! Next time I probably won’t soak my dates in boiling water as it made the dough too wet and I had to add about another 1/4 cup of almond flour. But WOW the flavor is incredible. They look delicious and they came out even better!!! So glad I found this recipe, thank you guys! I was going to make these tonight to bring to school tomorrow for co-worker who is vegan. I can these tonight with the glaze and just refrigerate? Let me know when you have a chance! That should work! You may want to bring them to school in an insulated bag with ice packs as the coconut glaze will begin to melt at room temperature. Hope that helps! This recipe is amazing. I did two batches to have enough for our ladies Bible Study. I dipped some in real white chocolate, some in home made vegan white chocolate, and the rest in the suggested glaze with the recipe. I think the favorite was the glaze in the recipe since this gave the most delicious flavor. Seriously the BEST! I made it for a bunch of friends and they all raved about it. I was hesitant to make these—in fact, I had the ingredients for several weeks before I decided to tackle the recipe. They looked delicious but I just didn’t believe they’d turn out like the photo (I always have problems with dates). I was so wrong! These are amazing! I’ve been following a gluten-free diet and often crave something sweet, so I’m excited to have these in the fridge so I can grab on the go. I made the recipe mostly as-is, and the only adjustment I made was to add another 1 T of maple syrup to the glaze. Hi mam,how can i use millets in this recipe? Hmm we have not tried using millet and can’t say for sure. Sorry! If you experiment, report back on how it goes! Made these twice this month because they’re THAT good. The second time around I managed to roll them into 48 smaller bites *just* so I could enjoy them for a while longer. These little yummies don’t last! Made these and they are insanely delicious. Perfect sweet treat to satisfy a craving. Made exactly as written and it was easier/faster than I thought it would be. Thank you!! I have made your cake bites but raw almonds and walnuts tend to make my mouth a itch… is it possible to toast them first? Or does this ruin it? These are delicious! Made them without the glaze. My 4 yo and 6 yo LOVE them too! Made these today, they were fantastic! A great dessert, but still super healthy! I used figs instead of dates because they were on sale at the store and they came out just fine! I also used chia seeds instead of poppy and they still taste wonderful. Thanks for another amazing recipe! A couple responses I got said that these looked like meatballs, so next time I make them I’m going to try a different shape (either cookie cutter shapes or flattening a bit, or adding sticks like for cake pops) and adding garnishes to make them look a bit daintier. Great recipe, will make these again for sure! My junior kindergarten daughter cannot bring nuts to school for her snack, and we are dairy-free. I want her to have healthy fats and protein in her snacks. Would you recommend subbing seeds for the nuts? I know she would be excited for this. These were pretty good, although not as cakey as I’d hoped. They were more so like a larabar in texture. Anyone have suggestions how to make a fall pumpkin version of donut bites?! I’m not sure how adding pumpkin puree will affect the consistency! Would also add pumpkin spices, chia instead of poppy, & not sure what to sub instead of lemon/lemon zest, unless that would still taste ok! TYIA! Hi Jasmine! We haven’t tried making a pumpkin version, but if you experiment with it, we’d love to hear how it goes! Good luck! Once again, I am blissfully enjoying yet another recipe from this blog. Putting this recipe together is simple. Once the finished product sets up camp on your taste buds, you never want to go home. I am trying to get back to some healthy eating and sweets beckon me like that “bad boy” I dated in high school. Oh so tempting and oh so bad for you. Not these little sweeties. I have found a Hughe Jackman of sweets…the whole package (if he is really like the fantasy I have constructed of dear old Hughe). Make these. You won’t be sorry! Hi Dana, love this recipe! My challenge with this (and the vanilla cake bite recipe) is my food processor – it’s a mini (3 cup?) and really too small for the job. I make a lot of recipes (many of yours!) and think an investment in a bigger, more powerful processor would be wise. What kind of processor do you use and how big is it? Thank you so much!! Btw, I may have finished all of the donut holes (or dough… can’t say they really made it to donut hole form). :D I will definitely be making this recipe again! I made these exactly as the recipe stated, and they were very good. The lemon flavor is excellent. Yay! Thanks for sharing, Chari! I made these the other day. Fabulous! I did not use the glaze because I’m trying to cut back on coconut oil and they were really quite delicious (lemony!) without it. The only snag I ran into was mixing ALL of the ingredients together in the blender. Too sticky. I mixed it by hand and it came out just fine. Just made these, as I have been eyeing up this recipe since seeing it posted. They turned out amazing. Definitely a recipe I will make on repeat! Such a perfect snack that tastes so indulgent with no guilt! Yay! Glad to hear that, Maria! Made these twice this week– and even my non-vegan friends loved them. Used just cashews as the nut base, and chia seeds. I reduced the amount of oil in the glaze (by quite a bit the second time) and it worked just fine. Delicious! This recipe did not turn out right for me at all. Such a bummer. They were neither cake-like nor fluffy. More like super sticky. I did raw cashews (no walnuts), dates, and almond flour (no coconut flour) all from Trader Joe’s. I cannot for the life of me figure out what went wrong. I even added probably an additional quarter cup of almond flour and I still just ended up with one big ball of dough in my food processor. It tastes ok, but it’s definitely not the right texture. Any hints you can give for next time would be great. Thanks. MacKenzie – I will say coconut flour adds a cakey flavor and texture so next time try and use that! It’s not essential, but I love the blend of coconut and almond flours in this one! Hope that helps. I made these yesterday and they taste excellent, especially with that glaze, wow! I made them with almond meal instead of flour bc i had a lot of almonds and no flour and the dough/texture came out good. Great recipe Dana! Will make again for sure. Whoop! Thanks for sharing, Elena! I have in my menu plan in two weeks and cannot wait to make them!! We hope you love them, Julia! In my home everybody LOVES the “no bake vanilla cake bites”, so when I saw this version I just have to try it. They are delicious! I skipped the glaze and just roll them on unsweetened shredded coconut. Yay! We are glad you all enjoyed them, Genny! I love this! Can you please make a version of this with carrot cake spice?! We have a cake coming soon that can be easily turned into bites! haha, yay! Thanks for sharing, Krissy! These were really great and easy to make. I used almond flour as written and subbed whole wheat flour for the coconut (since that’s what I had available). My one mistake was putting extra maple syrup in the glaze, which made it too sweet. I thought it wasn’t quite sweet enough when I first tasted it, but I should have trusted the recipe! Anyway they were fantastic and I will definitely make again. I might put more poppy seeds next time, and maybe some almond extract. It’s definutelt a recipe that can be played around with. I’ve been making the raw donut holes from My Rawesome Vegan Life for a months now. My husband protests if they aren’t in the freezer. So these…were amazing…and so much easy. Yah for no nut soaking. I actually threw it all in my food processor at ones and they still turned out great (processor is pretty durable and strong). One request though…please please please more variations and flavors of these donut holes! Thanks for the great work you do! Lovely! Thanks for sharing, Jaime! More added to the list! I normally Love your recipes, but this one was a disaster for me! Please advise. Here’s what I think the problem is: dates have a highly variable moisture content and texture. Could you describe the dates you used? What variety? Room temp vs cold etc. I made mine with fresh gooey Honey dates from the farmers market, that had been sitting out all morning, and blended them really smooth, so that was probably mistake # 1. 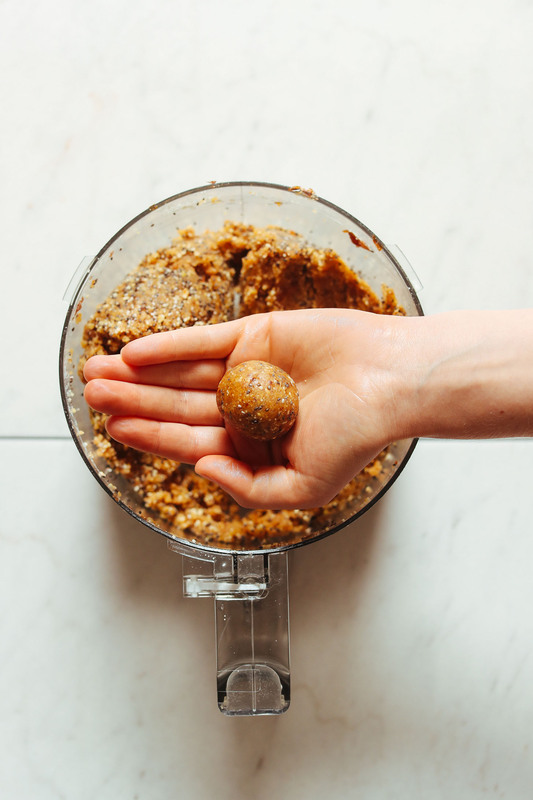 Next, with the walnut/cashew part, it would be helpful to see a photo of the nut texture, after you processed them but before adding all the other ingredients. I may have over blended my nuts, not sure. I also believe that nuts and nut flours have a variation in moisture content, which could affect the out come. I would love to try these again, but don’t want to waste more expensive ingredients in the process. Thanks! Jacky it sounds like the mixture was just overblended. In that instance next time I’d recommend just pulsing the dates until small bits remain (not a puree). And for the nuts make sure they’re the consistency of a meal not a powder. When dates are really fresh they can be easy to overblend. You could probably even get away with just finely chopping them next time. Hope that helps! Made these for my vegan 16 year old for her birthday cake! Its what she wanted and we loved them, well except for my 17-year-old son who doesn’t like anything vegan… hmm, not sure he actually tried them! I made this yesterday morning and they were delicious. I used 6 tbsp lemon juice (I really love lemon) and all almond flour with one dunk in icing. I’ll definitely make again! Might try with apple cider instead of lemon juice for a fall treat! Can I use a vitamix instead of a food processor? 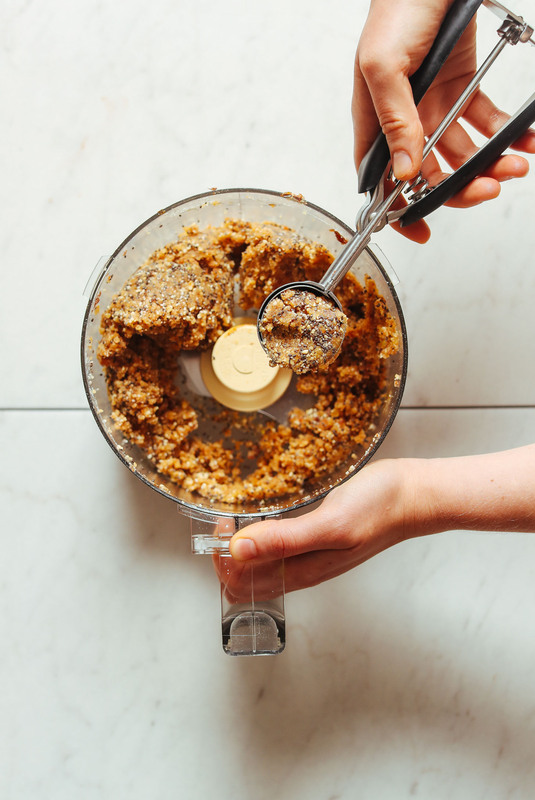 We usually prefer a food processor because it’s easier to control and not over blend. But if you try it let us know how it goes! It should work if you go low and slow. I didn’t think it could get better than the cake bites you shared – but this is bliss!! They are so delicious, I even went all out and picked up poppy seeds. Next time I’ll try chia. Thank you for all of your lovely recipes, I look forward to your posts every week! 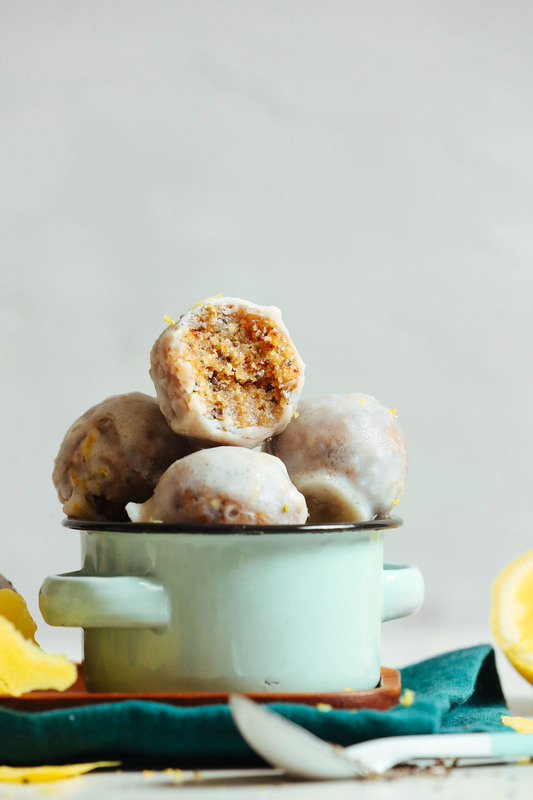 Donut holes just made of dates, cashews, almonds, coconut, and lemon poppyseed goodness? SOLD to someone who LOVES donuts and lemon poppyseed-flavored ANYTHING! This sounds like a wonderful recipe. I need to buy coconut flour and almond flour now. They are just very handy ingredients in general, so might as well catalyze experimentation with them with this recipe! Made these this morning — Holy cow! So yummy! Ended up needing to add about 1 tsp extra lemon juice to the dough to make it tacky. Rolling them in the glaze twice was perfect. Thanks, Hannah! Next time would you mind leaving a rating? It’s super helpful to us and other readers. xo! This looks yummy! I am allergic to coconut, and I saw where you can just use all almond flour in the recipe for the donut. But for the glaze, do you have an option that involves no coconut? Thanks! I don’t have any glazes that don’t use coconut at the moment. But if you find something that works let us know! Can I use regular flour instead of almond and coconut? Not sure but if you give it a try let us know how it goes! My husband loves poppy seeds but not glaze. Would they be too sour without glazing them? Would I still need to freeze them? I think they’re great even without the glaze! No need to freeze at that point – just refrigerate. These look so cool! I would love to see an apple cider doughnut version, or pumpkin. :) I might try some experimenting. Thanks!! Hi, I made Date paste and have it in a mason jar in my fridge. Can I substitute it and how much would I use for this recipe? Hi! Can you just use a gf mix like Bob’s Red Mill to sub instead of the separate flours? We’re not sure but let us know if you give that a try! Some variation should work. Is it ok to eat raw all purpose flour?? are the raw nuts a necessity for texture or for taste? We have a tree nut allergy so can’t use those or the almond flour. Coconut flour is ok though. I’d say use all coconut flour. I mean this part…do I sub walnuts/cashews with something else? Any tips for avoiding the glaze building up on the bottom of the balls? Glaze them on a fine wire rack. However, know that glaze will drip down below them and potentially be wasted. I will try the wire rack idea too. They were amazing except for the build up of coconut oil at the bottom of the ball. Thank you for this idea to try next time. This recipe is a keeper! Hi Dana! I’ve recently become allergic to all kinds of nuts (yes, I’m still in the middle of my grieving process 😉). Do you have any recommendations for a nut-free version of this AMAZING LOOKING recipe? Yes, I was wondering as well! A nut free version could be done by using a lot more coconut flour and subbing the other nuts for seeds, such as hemp or sunflower? Thanks for the recipe. Is it possible to omit/substitute the dates? You could try and sub maple syrup, but it will require a lot more dry ingredients and perhaps a nut butter, such as cashew. Let us know if you play around with the recipe! WOW! Now we just need a BAKED version…. SWOON! I was wondering about this too? I’m thinking it would be important to toast in a pan for a few minutes and cool down before using it in the recipe. I won’t be using all purpose flour myself; just hoping to help out the ones that choose to. I’m going to try this recipe using all oat flour. A short note of heartfelt thanks for your generosity and passion that inspires such a river of amazing recipes! Your example of creative compassionate cuisine is wholly inspiring and a beacon of hope and positivity in this often dark world. I also love your language and the light touch that garnishes the enthusiasm oozing out of every page! The photography is top-shelf, seriously compelling me to go to kitchen and food processor! Hi! Love the recipes! Would you be able to suggest how I can substitute all purpose flour instead of almond flour, as I don’t have any on hand? Hi! Loved he idea of lemon poppy seed in a raw ball version! Just wanted to ask if the balls need to be stored in the freezer because of the coconut oil based glaze or if it’s not necessary. Do you have any recommendations for another flour I could use aside from almond flour? I have a mild almond allergy (no other nuts). It’s annoying and so hard when you’re a GF person and mostly vegan. Lemon poppyseed is my favorite flavor for pretty much any baked good. Tigernut meal is supposed to do the trick and taste quite similar to almonds! I subbed millet flour for this recipe, but have subbed GF flour in the vanilla cake bites recipe. I think I may have also tried brown rice flour in one rendition. Some people might try oat flour (I’m allergic to oats as well as almonds). I think someone else has already mentioned coconut flour. I cannot wait to make these! How have I had all the ingredients for donut holes in my kitchen and not known it until now?! Naturally sweetened, and I love that you’ve included oil free alternatives too. Fantastic.